Since the 19th century Bach’s music has been source for endless interpretations, transcriptions and adaptations: Bach’s perfect proportions and counterpoints have been played trough years on all kinds of instruments. 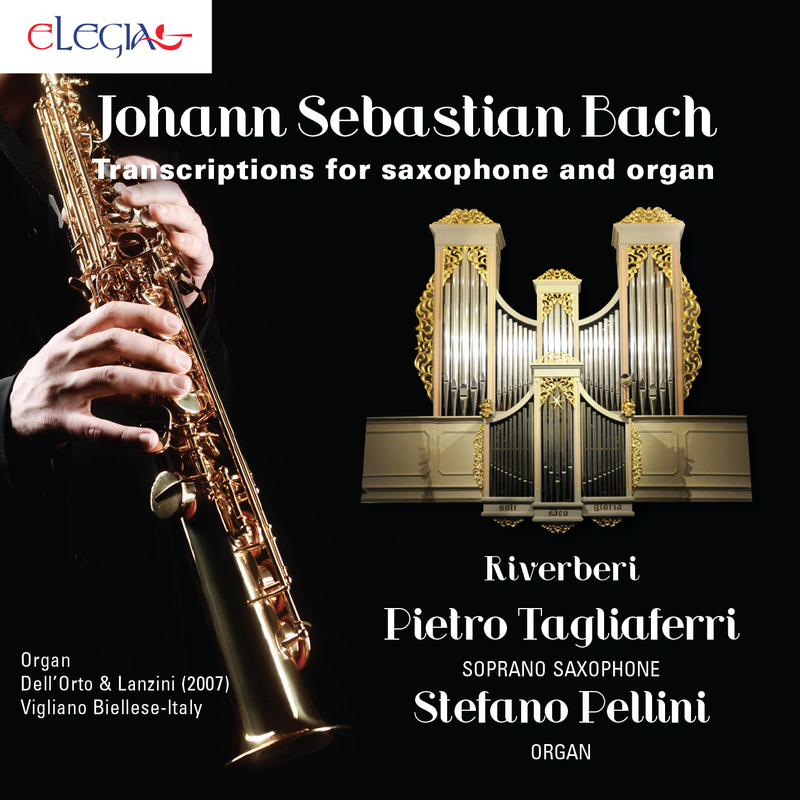 The project “Riverberi” is giving his particular contribution on this compact disc, exploring Bach’s repertoire from an unusual point of view: the sax soprano (an instrument that Bach couldn’t know because invented later on) . If it’s true that Bach’s scores had been transcribed countless times is also true that within these scores we count a lot of transcriptions made by Bach himself. In particular he loved Vivaldi so much that he transcribed for keyboards his concerts in order to make this hugely popular music playable by a single performer. In the opener on this CD, the F major concert BWV 978, the orchestral part is given to the organ while the sax reproduces the former violin solo parts. In the choral prelude “Wachet auf, ruft uns die Stimme” BWV 645 the choral part is played in the organ trumpet register while the saxophone embellish with the utterly beautiful melody that symbolise brides’ walk waiting for their husbands according to St Mathew’s gospel. A signifying anthology about Goldberg’s variations BWV 988 allows the players to shed a light on melodies otherwise hidden in the original scores. Also the aria for contralto with oboe “Qui Sedes” offers a contrast between the two instruments: besides opening and closing the performance the oboe/sax plays with the contralto/solo register of the organ creating interesting textures. No other ways of composing value the contrast between voices as the Bach’s widely used form “trio”. On top of that the key of the first trio sonata is E major flat, which in Vigliano’s pipe-organ Lanzini-Dall’Orto assumes a peculiar character, sometime harsh, sometime shiny. In the bright opening sax and organ exchange themes and melodies, the following movement is a dialog between reed instruments, the sax on one side and the organ Dulzian register from the other. Lastly the two instruments seem to chase each others creating a nice circular effect. The simple descending melody that opens the ‘Largo ma non tanto’ concert BWV 1043 is here played from the organ, suddenly echoed by the sax/first violin in a such refined rhyme that can be easily mentioned as on of the finest pages from Bach’s production. In the aria for soprano “Mein Glaübiges Herze” the playful theme played by the saxophone is counterpointed from two bass lines, in particular from the opposing melody performed by the violoncello piccolo (organ reed); in the unusually long final coda the oboe line is assigned to the sax and one more voice is added to the already rich polyphony: here the dialogue became admirable producing a really intriguing and effective outcome. The Symphonic Inventions are well known pages also because compulsory steps on the educational path of each keyboard player. Listen back to B minor Symphony n.7 BWV 793 on this instrumental arrangement value the movement of single voices, assigned to three different sources of sounds (first keyboard organ pipes in a higher and central position, the saxophone in a central position, and the body of the second keyboard , the Rückpositiv, placed in a lower position, closer to the listener). If the toccata and fugue in D minor highlights the shiny and full sound of Vigliano Biellese’s pipe-organ. The famous Choral form Cantata BWV 147 offers again Riverberi’s signature sound with a persistent movement of triplets. The record closes with the delicate and lyrical “Liebster Jesu, wir sind hier” were the human invocation to god (beloved Jesus we are here) finds place in the round sound of saxophone, with precious embellishments from the organ Cornetto register.